I have always donated to the various worthy causes that help protect the World's Wildlife. My problem is that no matter how much I donated it was only a drop in the ocean which is why I have donated original artwork and prints to various organisations, in the hope that they can sell or auction them for far more than I could afford to donate. The links to the Wildlife organisations below are the ones I have, so far, chosen to make donations to from sales of artwork and prints. I was invited to join Artists Against Extinction by the founder. It's a group of artists with a passion for Wildlife and Conservation. All have their particular charities which they donate 25% of sales made through Artists Against Extinction. Other links below are a number of my artist friends. The David Sheldrick Wildlife Trust - Dedicated to the protection and preservation of Africa's Wildlife, particularly endangered species such as Elephants and Black Rhino. 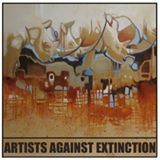 Artists Against Extinction is a non-profit making venture. Artists have agreed to donate 25% of their sales of artwork via Artists Against Extinction to a Conservation organisation of their choice to help conserve the World's declining Wildlife. My chosen charities are The David Shepherd Wildlife Trust and Thandi's Endangered Species Association. Thandi's Endangered Species Association is a non-profit organisation that helps to raise funds and educate about the importance of protecting endangered species worldwide. Thandi is the name given to a Rhino, a survivor of poaching. Not only did Thandi recover from her horrific injuries, she gave birth to a Calf early in 2015, sending a message of defiance and hope for the survival of the species. Paws for Charity - celebrates the special bond we feel with our pets and raises money for charity. The Paws for Charity art book is an annual project. I have two drawings included in the book for 2012.